My one hobby is reading books, I love more than curling up with a blanket and reading a good story, I do admit though that I tend to stick to the same genres. 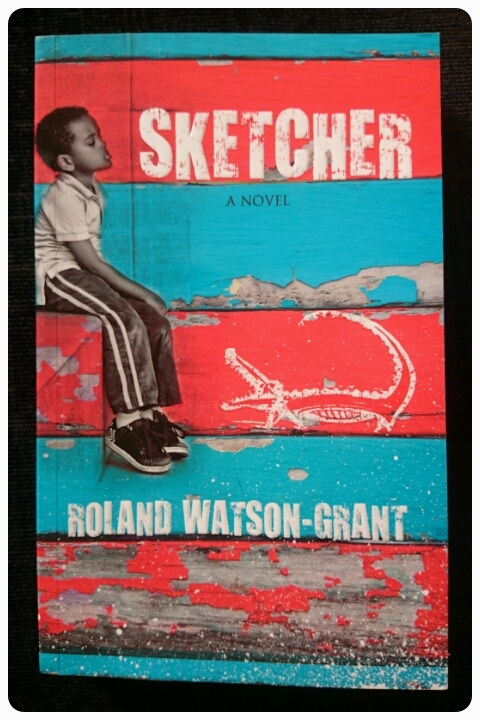 Of recent months I have tried to step out of my comfort zone and read books that I wouldn't normally pick up, so when I was asked to review Sketcher by Roland Watson-Grant I just had to say yes. Nine year old "Skid" Beaumont's family is stuck in the mud. Following his father's decision to relocate and build a new home, based on a drunken vision that Ne Orleans would rapidly expand eastwards in to the wetlands as a result of the Seventies' oil boom, Skid and his brothers grow up in a swampy area of Louisiana. But the constructions stop short, the dream fizzes out and the Beaumonts find themselves sinking in a soggy corner of 1980s Cold War America. As things on the home front get more complicated, Skid learms of his mother's alleged magic powers and vaguely remembers some eerie stories surrounding his elder brother Frico. These, as well as early events that Skid saw with his own eyes, convince him that Frico has a gift to fix things by simply sketching them. For the next few years, Skid's self appointed mission to convince his brother to join him in his lofty plan to change their family's luck and the world they live in will lead to even more mystery and high drama in the swamp. Skid is the youngest of four brothers. There is Tony who appears to be the "smart one", he manages to have logical things to say about every situation that arises. Doug is the one who looks to money to solve all his problems. And then there's Frico, from the beginning of the book you get the impression that he is allowed to get away with more than the others, he is extremely artistic and as you get from the blurb, Skid believes that Frico has a special ability to make his sketches a reality. "That boy was more than artistic. He had somethin' in his left hand, a strange power to fix things with a pencil. Like when Frico was four, he sketched a picture of a cat that had a broken leg. And the cat got better and walked away"
The story itself shows how this family grew up in the swamps. Skid narrates the story and he tells the tale of how they make it through the highs and lows of day to day life and all the dramas that pop along the way. Living in a one room shack on the outskirts of the bayou by New Orleans, the Beaumonts show just how people got by without the use of things like electricity. Making their own entertainment instead of being able to watch television, play on computers, I think it actually highlighted just what we tend to take for granted nowadays. I found the story was made more authentic by the way it was written using the southern accent and slang. It did take a little while to get used to but I found it gave the story more depth and I could really imagine them talking. I have to say the whole thing reminded me a bit of Disney's Princess and the Frog, with the accent and the use of magic (hoodoo voodoo). "Skid, your old lady is a witch and your brother is a wizard"
Overall I really enjoyed Sketcher. I have to admit that at the start, the book seemed to be slow going, but by the end I had been well and truly hooked. Affairs, psychologists, a mum who used to do hoodoo, it definitely wasn't short on drama!!! I couldn't have predicted the direction in which the book took, not what I was expecting at all. If you like the sound of this book then you're in luck, Alma Books have kindly allowed me to give away 2 copies of Sketcher, that means 2 winners!!! All you have to do is fill out the rafflecopter form below. The giveaway is open to UK residents only and will close at 11.59pm on the 27th July 2014. When I was little, my nan used to tell us she was a witch but her broom had got woodworm so she'd had to throw it out. We never questioned it; I still think of my nan as being a bit magic! It sounds really interesting, probably not the type of book I would gravitate towards in a bookshop but now I've read a review I'm quite intrigued! I love magic, it keeps me entertained and wondering! It's freaky, but surreal to watch - can't help but look! Mind blowing sometimes. I do not really want to know how it is done as we all need some magic in our lives.